Are you looking for an exceptionally strong single-ply roofing option? If so, you’ve likely heard of thermoset roofing membranes, also known as vulcanized roofing membranes. If you don’t already know, systems such as TPO and PVC are thermosplastic membranes, which means they are heat welded together at the seams after application. Thermoset membranes on the other hand, such as EPDM vulcanized rubber roofs, are sealed and bonded prior to application, which makes for an incredibly strong resistance to damages from rain, wind, and UV rays. At ECO Commercial Roofing, we are happy to provide our clients with professional installation of vulcanized rubber roofing in Texas, Louisiana, and Mississippi, as well as a selection of other thermoset roof membranes! What Makes Vulcanized Rubber Roofing Special? This EPDM Vulcanized Rubber Roof is Incredibly Durable, and a Great Addition To Any Commercial Roof! 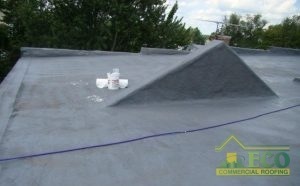 As we mentioned before, vulcanized rubber roofs are a type of thermoset roofing membrane. These membranes rely on chemically cross-linked principal polymers, that create an incredibly strong, and chemically resistant surface over the material. This prevents non-specified chemicals and solutions from adhering to the surface at all. That’s why with restorations of EPDM vulcanized rubber roofing require a specific type of rubber roof coating for optimal results. At ECO Commercial Roofing, we can provide you with professional vulcanized rubber roof restoration, as well as restoration of other types of thermoset membranes. Other types of thermoset membranes include CSPE (chlorosulfonated polyethylene), ECH (epichlorohydrin), CR (neoprene), and PIB (polyisobutylene). Why Choose Vulcanized Rubber Roofing? When you want a roof that can stand up to all kinds of weather conditions, and will last for decades, you can’t go wrong with an EPDM vulcanized rubber roof system. Vulcanized roof systems are designed to provide great resistance to water leaks, water ponding, UV damages, and more. EPDM stands as one of the most commonly used commercial roofing materials due to this incredible durability and longevity. If you’re interested in learning more about thermoset roofing membranes, or if you’d like to request a quote for vulcanized rubber roofing in Texas, Louisiana, and Mississippi, give us a call today at (833) 200-0571! We are happy to help you with any and all of your single ply membrane needs. We have over 20 years of experience in the roofing industry, and we specialize in roof restoration services.